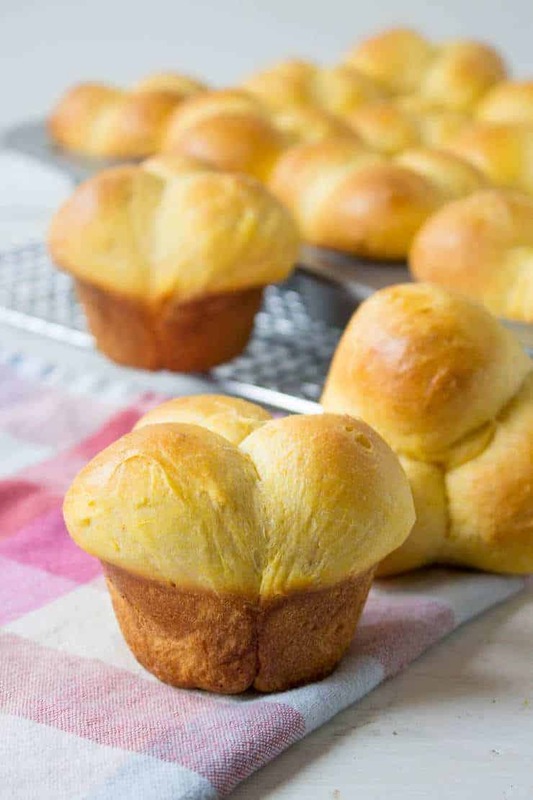 Light and fluffy dinner rolls made with mashed sweet potatoes. Are you looking for a perfect dinner roll? These sweet potato dinner rolls are so light and fluffy and have just a touch of sweetness from the sweet potatoes. Your friends and family will be asking for them again and again. The secret to making these great rolls? Sweet Potatoes! Okay, so I guess that’s really not a secret since sweet potatoes is right in the name, but seriously the sweet potatoes really add a little extra something to an ordinary dinner roll. I used one whole sweet potato and boiled it, skin on until it was soft. Just test with a fork. If the fork goes through easily, the potato is done. Once the potato is cool enough to handle, use a pairing knife to remove the skin and then mash the potato with a fork. You want it as smooth as possible, but a few small bits are okay. I make a lot of different rolls including oatmeal rolls and dinner rolls. In a large bowl of a stand mixer, add milk, yeast and honey. Let sit for 5 minutes until bubbly. With mixer running slowly add the flour. 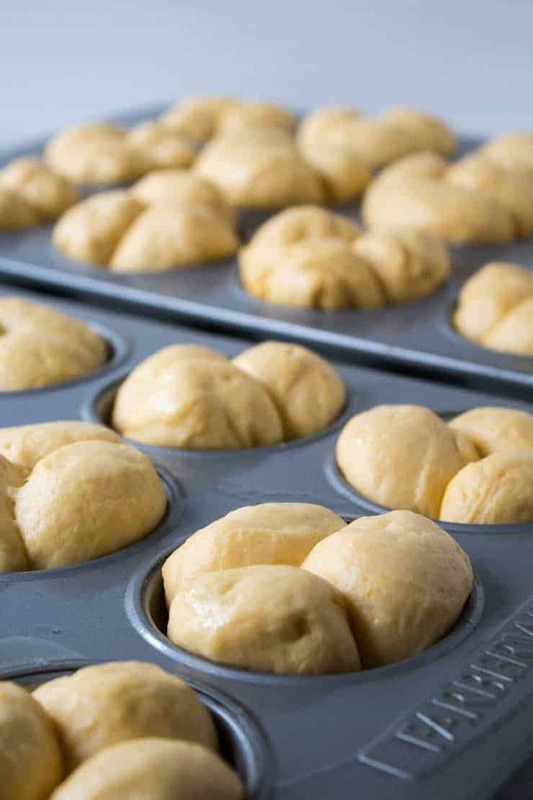 Continue adding flour until dough comes together and begins to form a ball. You might not use all the flour. Knead in mixer for 5 minutes. Remove from mixing bowl and place into a large greased bowl. Cover and let rise until doubled; 1 - 1 1/2 hours. Remove cover and punch dough down. Divide dough into fourths. Working with one fourth at a time, divide each fourth into six equal parts. Shape into rolls. To make the cloverleaf shape, continue dividing each part into thirds. Roll each third into small balls. Drop three balls into a greased muffin tin. Cover lightly and let rise for 30 minutes. 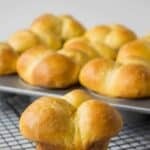 Brush top of rolls lightly with melted butter. Bake in a preheated 375 degree oven for 15-18 minutes. Remove from oven and let cool slightly for a few minutes on a baking rack. Remove from tins or baking sheet and continue cooling. These look great! So light and fluffy! 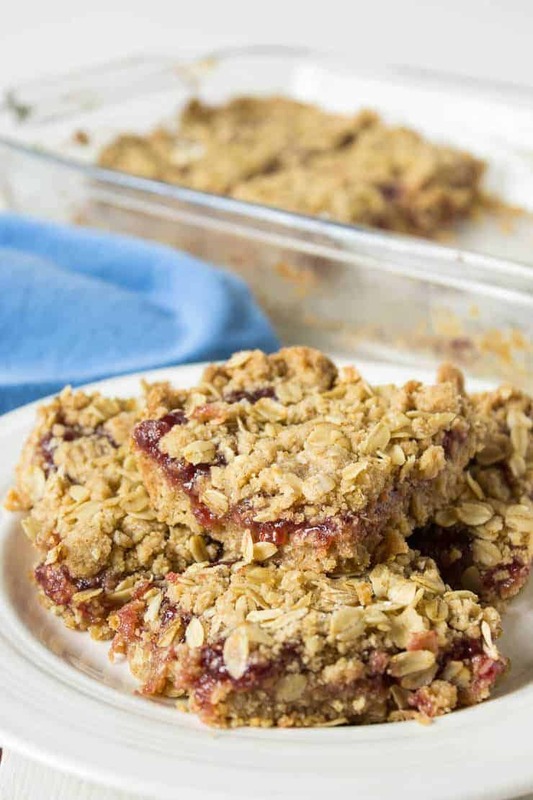 They are light, fluffy and delicious! These are such beautiful little dinner rolls. I am hosting a dinner party soon. I will be making these!! Your guests will be very impressed! I would ask for these over and over again too, Kathy! They look like fluffy little clouds! This looks like a great weeknight meal option! My husband likes some sort of bread with every dinner, this is perfect! Thanks for sharing. These look wonderful! I’ve made sweet potato bread before (more similar to banana bread than sandwich bread), but never anything like this. It also looks like a great way to use up a lone, left over sweet potato…which is a situation in which I find myself often! Thanks! Now you will know what to make the next time you have some left over sweet potatoes! Hi Kathy, Thanks for the great recipe! 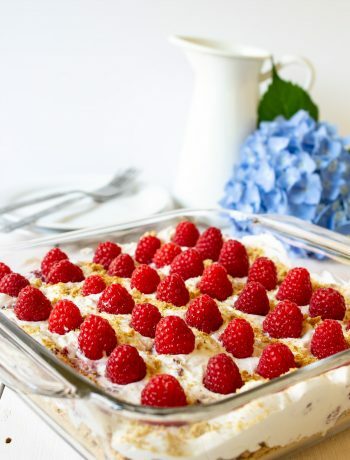 I posted a photo of mine on my blog with a link back to your recipe. (I used half whole wheat flour with mine). Thanks again! I checked out your pic! They turned out lovely. I’ll have to try a blend of whole wheat flour next time. Love sweet potato dishes. 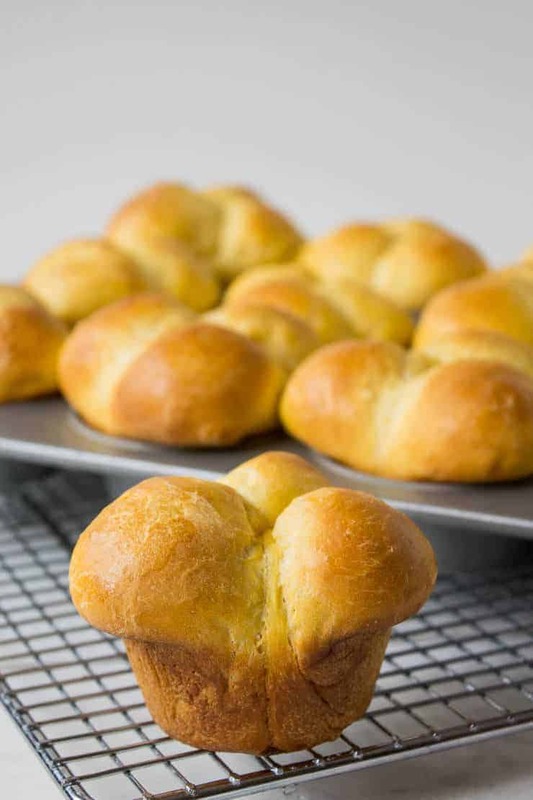 And how light, fluffy, and soft these dinner rolls are — so delicious perfectly baked. Potatoes add such a great texture to bread…sweet potatoes do the same! How gorgeous are these Kathy?! They look totally light and fluffy. Love the sweet potatoes! Thanks, Mary Ann! The sweet potatoes added a bit of flavor and a bit of color! 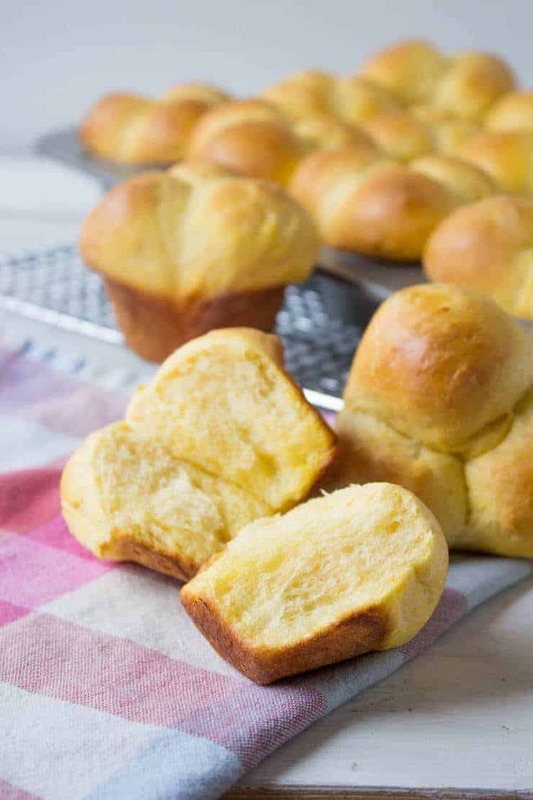 It’s probably not the healthiest thing in the world, but I could totally make a meal out of dinner rolls, so these are definitely screaming my name! They look fabulously fluffy and I’m digging that you used sweet potatoes!! I could use a dozen of these right about now! Cheers! It would be fun to see if anyone could identify the sweet potatoes! I love a good dinner roll, and it’s been quite a while since I made sweet potato bread. I could get on board with this one! Plus, Robbie loves sweet potatoes…so we always have them in stock. One of those is going to turn into bread soon! Oh my, these look so perfect, I would love to start baking right now. And those hamburger buns above are exactly what I was looking for, my son wanted me to make burgers and I just hate those bought burger buns, they are disgusting. I would love to make yours. I love making my own bread. So much better than anything you can buy. Wow these look amazing! I just love their smooth shiny tops! Yum! 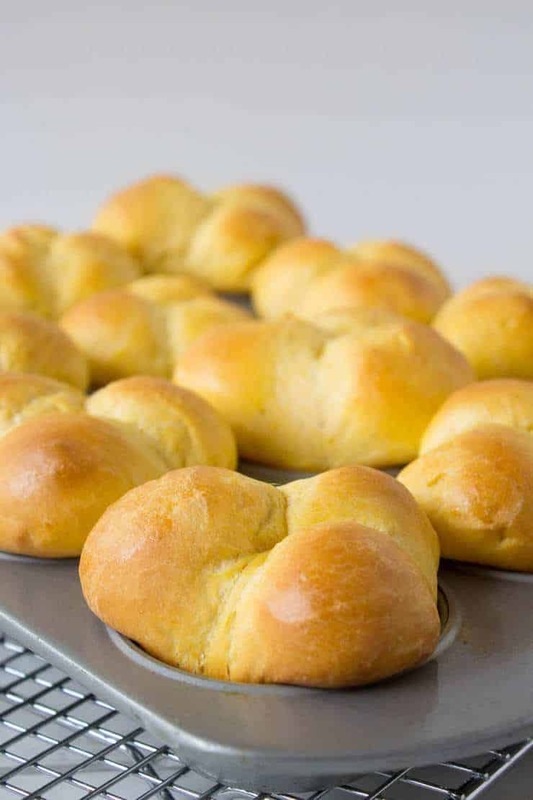 I don’t make dinner rolls very often, Kathy – but this recipe is calling my name. Love the sweet potatoes in there! I’m sure the sweet potatoes make it healthy….right??? Oh my, Kathy, these dinner rolls look beautiful! I’ve never used sweet potato g bread (or rolls), but now that I see these, I am excited to try! And their shape is so pretty! Pinned! The shape is so fun to eat too…you just pull off one part at a time! These look so delicious fluffy!! I really enjoy the flavour of sweet potato and this is a brilliant idea incorporating them in a roll….perfect! Would love to cut open one (or three) of these straight out of the oven smeared with butter 🙂 Pinned! Hope you’re having a lovely weekend! They are hard to resist coming straight out of the oven!